Zebra’s new ZT230 printer is the ideal replacement for previous generation Stripe and S4M printers. The ZT230 series features a space-saving design, effortless setup, intuitive user operation, and ease of service and maintenance. 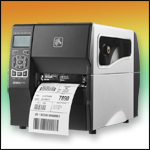 Whether you are adopting barcode technology for the first time or upgrading existing printer models, the ZT230 series is the right choice for a variety of labeling applications. The ZT230 offers standard USB and serial connectivity, as well as options for parallel, internal 10/100 Ethernet and 802.11b wireless networking for simple integration and remote monitoring. In addition, the ZT230 also supports both EPL2 and ZPL II programming languages so replacement for older generation Eltron and Zebra printers is a breeze. Compared to similar light industrial printers on the market, the ZT230 thermal printer is an outstanding value. Model ZT23042-D01000FZ, Direct Thermal, 203 DPI, 6 IPS Print Speed, 128MB DRAM, 128MB Flash, USB, Serial, US Plug, EPL Language, ZPL Language. Model ZT23042-T01000FZ, Direct Thermal - Thermal Transfer, 203 DPI, 6 IPS Print Speed, 128MB DRAM, 128MB Flash, USB, Serial, US Plug, EPL Language, ZPL Language. Model ZT23042-D01200FZ, Direct Thermal, 203 DPI, 6 IPS Print Speed, 128MB DRAM, 128MB Flash, USB, Serial, Ethernet, US Plug, EPL Language, ZPL Language. Model ZT23042-T01200FZ, Direct Thermal - Thermal Transfer, 203 DPI, 6 IPS Print Speed, 128MB DRAM, 128MB Flash, USB, Serial, Ethernet, US Plug, EPL Language, ZPL Language. Model ZT23043-D01000FZ, Direct Thermal, 300 DPI, 6 IPS Print Speed, 128MB DRAM, 128MB Flash, USB, Serial, US Plug, EPL Language, ZPL Language. Model ZT23043-T01000FZ, Direct Thermal - Thermal Transfer, 300DPI, 6 IPS Print Speed, 128MB DRAM, 128MB Flash, USB, Serial, US Plug, EPL Language, ZPL Language. Model ZT23043-D01200FZ, Direct Thermal, 300 DPI, 6 IPS Print Speed, 128MB DRAM, 128MB Flash, USB, Serial, Ethernet, US Plug, EPL Language, ZPL Language. Model ZT23043-T01200FZ, 300 DPI, 6 IPS Print Speed, 128MB DRAM, 128MB Flash, USB, Serial, Ethernet, US Plug, EPL Language, ZPL Language.